O de Lancome from Lancome has been providing women with a cool evening fragrance since 1969. With its citrus aroma mixed with sandalwood, sweet florals and musk, this perfume is sure to complement your outfit for any nighttime occasion. Its unique scent is strong enough to make an impression the second you enter a room. O de Lancome can be worn in a number of situations, including dinner with friends or an after-hours cocktail with that special someone. I have been using this fragrance for over 25 years. i see here most people use it in the summertime. i use it after coming out of the shower. O de Lancome is the perfect fragrance. It turns to a citrus powder smelling fragrance, that is subtle but lasts. I receive compliments all the time. 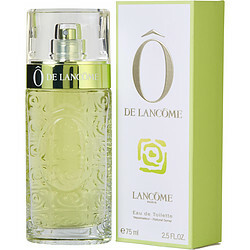 My absolute favorite time to wear O de Lancome is when it is very hot in the summer. Although I wear it year round. I highly recommend O de Lancome. O de Lancome is the perfect fragrance. It can be worn any time because of its quite fragrance. I wear it on hot summer days, when other fragrances are to heavy. I wear it to black tie events and smell wonderful. I can't think of any time or place that this long wearing fragrance isn't perfect. I constantly receive complements when wearing O de Lancôme. There isn't another fragrance that compares to this unique fragrance. I highly recommend. I love this fragrance, it is so clean and fresh for the summer. I wear this fragrance every summer. I bought this fragance for my aunt that used it long time ago. It has a citrus fresh smell.